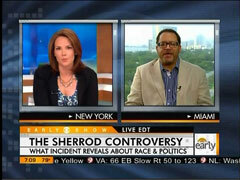 On Thursday's CBS Early Show, fill-in co-host Erica Hill discussed the firing of Shirley Sherrod with left-wing Georgetown University professor Michael Eric Dyson, who used the opportunity to slam conservatives: "...there's unfair pressure on the Obama administration, Mr. Obama himself, from, I think, the far right wing, which perceives black gain at the expense of white security." Dyson used the phrase "right wing" a total of eight times throughout the five-minute segment. He lamented how the White House "caved into duress and stress from the right wing" and later pushed the false claim that Fox News had pushed the Obama administration to fire Sherrod: "And it does show that Andrew Breitbart and other right-wing bloggers have an intense power, this is focused at Fox News, that then forces the mainstream media to pay attention and the White House itself got roped into this." At one point, Dyson remarked: "...it's not just a matter of 'oh, those right wing guys over there are horrible,' there's liberal enlightened racism as well." Hill responded: "The NAACP initially jumped on this and said – and condemned – condemned Sherrod as well. So, I mean, this is coming from all sides. This is not just a right wing issue or a left wing issue." Dyson admitted that he thought the NAACP acted "dishonorably," but quickly moved back to conservatives: "...why do we take the word of a right-wing media on the issues and practices and behaviors of people in the broader mainstream? I think we have to be very careful here." Later in the 7AM ET hour of the broadcast, Hill conducted a live interview with Sherrod in studio. During that interview, Hill alluded to the NAACP hurling racist accusations at the tea party movement as catalyst for the controversy: "...things that you said were taken, put on a website, edited, because someone had a bone to pick. Not with you. But with someone else, with something greater. How does that make you feel as a person?" Hill never explained to viewers that the civil rights organization had recently condemned "racist elements" in the tea party movement. Something else missing from Hill's interview with Sherrod was single question about some of Sherrod's other controversial statements. During that same March 27 speech to the NAACP, Sherrod accused opponents of ObamaCare and those in the Republican Party of racist motivations: "You know, I haven't seen such a mean-spirited people as I've seen lately over this issue of health care. Some of the racism we thought was buried. Didn't it surface? Now, we endured eight years of the Bush's and we didn't do the stuff these Republicans are doing because you have a black President." In addition, on Wednesday, Sherrod spoke to Media Matters and said this about Fox News: "I am just a pawn. I was just here. They are after a bigger thing, they would love to take us back to where we were many years ago. Back to where black people were looking down, not looking white folks in the face, not being able to compete for a job out there and not be a whole person." Hill made no mention of these comments but did ask Sherrod about the state of race relations in the country: "Do you think the government, and even perhaps the American people, are ready to deal with issues like this, the quick reaction, the knee-jerk reaction because someone is so afraid of any perceived bias or any perceived racism?" ERICA HILL: And joining us now from Miami this morning, Michael Eric Dyson, who's director of sociology at Georgetown University, he's the author of more than a dozen books as well, including the upcoming 'Presidential Race' about President Obama and the issue of race. Good to have you with us this morning. MICHAEL ERIC DYSON: Good to be here this morning. HILL: As we heard yesterday from Robert Gibbs, he said the people wanted a quick response, the administration wanted a fast response, but in going for that fast response it seems that due diligence was thrown out the window. Why is this happening seemingly often? DYSON: Well, I think part of the reason is that we're responding to certain segments. We're not responding with accuracy and speed to certain elements of African-American life. We're not responding to the need of African-American people to see targeted policies toward issues that effect them. But we are seeing rather quick responses to the right-wing media. And there's unfair pressure on the Obama administration, Mr. Obama himself, from, I think, the far right wing, which perceives black gain at the expense of white security. And I think the White House, unfortunately, in this period, caved into duress and stress from the right wing, which was inaccurate, number one. And number two, what's interesting here is that if that same right wing is not trusted in the Obama administration for views on its own policies, why would it take the word of that same right wing on the practices of somebody in its own administration? It's a rather paradoxical situation in which the Obama administration finds it. And finally, I think, again, what this begs for is a clear and direct engagement with race at the top of American political echelon, which is at the White House, and then we won't have these kind of contested crises that end up doing more harm than good. I think ultimately here, Miss Sherrod was an example of the very redemptive story line of race that Mr. Obama could seize upon and then make a valiant and valid point about how we can overcome together when we work past our own prejudices toward a greater end. HILL: And of course – of course the ultimate irony here is that her speech was not about, necessarily, black and white and the struggles there, but the struggle between the have and have nots. You mention the need for this conversation about race to happen at the very highest levels, but it seems there have been several attempts for that to happen. And I know you have been engaged in some of these conversations, you've been consulted. Why is it still so difficult for people in this country, at every level, to talk openly and honestly about race? HILL: The NAACP initially jumped on this and said – and condemned – condemned Sherrod as well. HILL: So, I mean, this is coming from all sides. HILL: This is not just a right wing issue or a left wing issue. DYSON: -but the progress that we've made and the possibility of moving toward a greater future. HILL: And the lesson – a lesson for everyone on all sides of this debate, that there is a little something called research we clearly all need to do a better job of. Professor Michael Eric Dyson, appreciate your insight this morning. DYSON: How about that? The facts – the facts are critical. Thank you. HILL: A good point. Facts are critical. Harry, on to you, now. SMITH: That old, 'never let the facts get in the way of a good story,' right? ERICA HILL: We want to recap for you the explosive story we reported earlier in the program, dominating headlines this week. Three days ago, a video clip was posted on the blog of a conservative activist, it shows Shirley Sherrod, a USDA official, talking about her reluctance to help a white farmer some 24 years ago. That video quickly went viral. Sherrod was forced to resign and then the entire video surfaced and that's when it became clear her original statement completely taken out of context. Agriculture Secretary Tom Vilsack has since apologized and offered her another job. TOM VILSACK: We had an opportunity to discuss a unique opportunity here at USDA that might be of interest to her. HILL: Shirley Sherrod joins us live here in the studio this morning. Good to have you with us. SHIRLEY SHERROD: Thank you. Good to be here. HILL: I'm sure it's been an exhausting few days for you. HILL: There's so much to talk about how quick everyone was to react to this. The administration, the NAACP. You said you weren't even given a chance to explain. You basically were told to pull over on the side of the road, resign on your Blackberry. What does that tell you about the state of things in this country that everybody was so quick to say, 'you were wrong, you're out'? SHERROD: Yes, that – it tells me that we've gotten to a point where we can't – we're not interested – well, I guess I shouldn't say interested in the truth. But we're not willing to take the time to look at all of the facts before jumping out there to make decisions. Decisions that were so wrong in this – especially in this case. HILL: And when you look at your case specifically, you were taken – things that you said were taken, put on a website, edited, because someone had a bone to pick. Not with you. HILL: But with someone else, with something greater. How does that make you feel as a person? SHERROD: Andrew – yeah. As much as he's saying it was about the NAACP, he had to know that it was about me. He was willing to destroy me to get to what he thought – to try to destroy the NAACP. I don't see how he could connect the two, because the NAACP didn't make those statements. I made the statements. I told the story. I was using my life to really help people see how I changed. And in doing that – and I have every – you know, if you hear my story, you know I have every reason to think differently. But in telling my story, how I moved to a place where I could work with anyone, it helps others to see that they can do the same. HILL: And it seems to be the ultimate irony, too, that your story, which was about understanding, it's not about black and white or different races, but it's a struggle for the haves and the have nots. The ultimate irony that that story was used, in fact, to hopefully portray the exact opposite. SHERROD: Right. That's why he had to know what he was doing. I think he – I'm certain he didn't think the other side of the story would come out, but he knew he was misrepresenting the facts. HILL: Has he apologized to you? HILL: Do you expect an apology? SHERROD: No, I don't. That's the – from what I – you know, I don't know him, never heard of him before this happened. But from what I think he is, I don't think I would ever receive an apology. HILL: Would you consider legal action against him? SHERROD: I haven't talked about it actively, but I would definitely consider it. HILL: You've also been offered a job, a new job, not your old position, back with the Agriculture Department. I know you still need time to look at the offer, but essentially, be dealing with civil rights issues. HILL: Is that something that you'd like to be involved in? SHERROD: You know, that's something I've been involved in since 1965. So it's not something new to me. Maybe it's something new to the department, but it's definitely not something new to me. I would not like to be the one person that this country is looking at to solve all of the problems of discrimination within the Department of Agriculture. They have been going on for years, in terms of black farmers and now Hispanic farmers, Native-American farmers, women farmers. There are many, many, many layers of issues there. And I don't know that the department is ready to deal with them. HILL: Which is sort of a sad statement to say that they may not be ready to deal with them. Do you think the government, and even perhaps the American people, are ready to deal with issues like this, the quick reaction, the knee-jerk reaction because someone is so afraid of any perceived bias or any perceived racism? SHERROD: You know, I would hope that by – you know, having gone through this, these last few days, it would help this country to really – people in this country to really look at what we're doing. You know, let's step back and see if we can have a new start. You know, if my suffering over these last few days can help move that forward, hey, I'm willing to be the fall guy for that. HILL: That's quite a fall, but you're rising up from it. And we do appreciate you taking the time to join us this morning. Shirley Sherrod, thanks.